Sorry guys, I've been a bit busy. Still feeling pretty decent overall, just busy. When I get home in the evening, I'm ready to sit and relax. Haven't really been feeling like blogging. But I have a minute here, so we'll go for it. Following my awesome endo appointment, I had my first appointment with my new therapist. This is my third therapist since I first asked for help. The first one didn't have the ability to see me often enough, and my second one left the practice. So we're on to number three. The first session was pretty much a get to know you session. We talked about why I sought help in the first place, what my particular disordered eating looks like, and the things that play into that, including diabetes. My new therapist, we'll call her J, doesn't appear to have a lot of experience working with people with diabetes, but she seemed to understand the basics and wasn't making assumptions, so that's good. We also talked about all the work I'd done with Dr. P. J was saying what tremendous progress I've made. And she's right. Compared to where I used to be, I've come so far. Thanks to treatment from some wonderful mental health professionals, and the support of my family, friends, and the DOC. I left feeling uplifted, like when I left my endo appointment. Another affirmation that the rough patches don't undo everything. Like yesterday. Yesterday was rough. It's been a stressful week at work. Yesterday afternoon, I binged some. But here's the thing: it wasn't as bad as it could have been. This is what helps me deal with the guilt and shame I feel. Did I binge on too many cookies? Absolutely. But did I continue to binge the rest of the day? No. I binged, I stopped, and I was able to move on. It didn't ruin my food choices for the rest of the day. I am better. Some days, that's incredibly difficult to remember. Some days, I still get completely overwhelmed and feel like I'm barely hanging on. But those days happen much less often now. That is what I try to remember. No matter what today holds for you, know that it will pass. 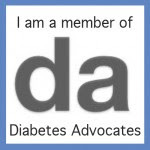 And the Diabetes Online Community is here for you. You're never alone in how you feel. As with my other therapists, J was amazed when I told her about the DOC. About the support and understanding I've found. And when I stop and think about it, it amazes me too. Thanks, team. And that would be because - people like you make it amazing. I'm so glad you're happy! Wednesdays would go better if we stopped missing our video chats! Great advice here... Thanks for sharing your story.